My story began in the tropics. I grew up amongst my countless banana brothers and sisters on a plantation in the Eastern Caribbean. There was no reason my life should have been any different than the bananas who came before me. Yet somehow, destiny had its own plans. You see, unlike my banana siblings, I grew very quickly. At first — the farmers were overjoyed. I was going to be a very large banana! But then I just kept growing…and growing…and growing. Soon enough, the tree I was on couldn’t even withstand my weight. They cut me down and pondered what they should do with me. Should they submit me to the Guinness Book of World Records for being the largest banana in history? Should they consider it a sign of divine intervention? Should they reexamine their planting methods? “You should let me make my own way,” I answered. Everyone was shocked. “Have you never heard a banana speak before?” Apparently not. In the midst of their silence, I was determined to leave the island. Clearly, this town was too small for a giant banana like me. I was headed to the city. Decades later, my entire life seemed to have fallen in place. But one thing still seems out of my grasp — how does a giant banana find love? I often think back to my time in the Caribbean, where things were easier and there were countless bananas everywhere the eye could see. Bananas are biologically built to be in bunches. Unless you’re a giant one, then it becomes rather lonely. But it was on the internet that I found my refuge. If you’re curious, this is my profile. I was a banana on the internet for giggles. But the results kinda exceeded my expectations. In the two weeks that I was conducting this social experiment, over 50 men tried to contact the banana. That’s 50 more than I had anticipated. Most seemed to just find it comical. One man in particular was very troubled by the banana. Others seem to have some sort of banana fetish. Not without buying me dinner first. For some, it was just love at first sight. 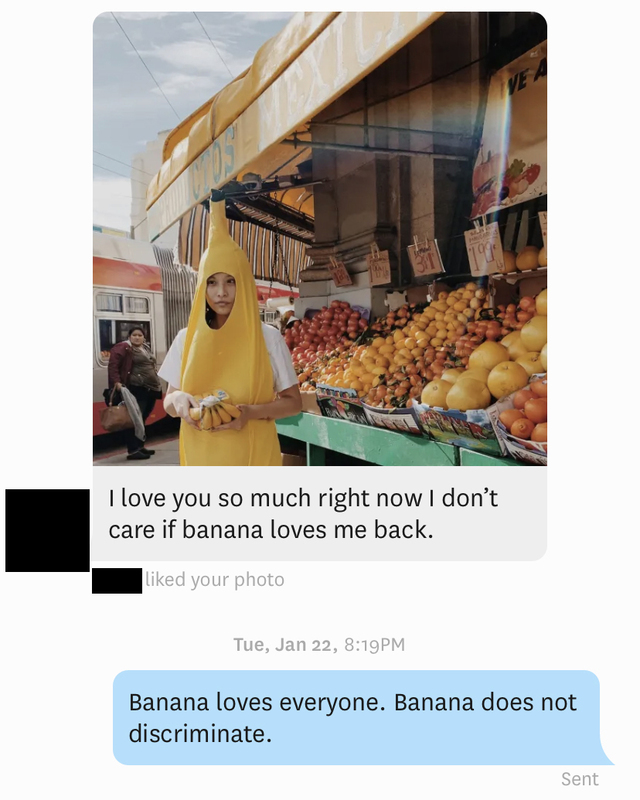 Banana will never let you down. Banana will never give you up. I’ll have to see a ring of course. Bananas are cannibals, didn’t you know? Hello? Is this Chris Hansen from Dateline NBC’s To Catch A Predator? I have a man preying on young bananas. Many people seemed amused though. Or at least proved they could roll with a joke. It’s important to get your daily serving of banana. Except for one man. One man was not having it. I know with Valentine’s Day around the corner — some of you may find it hard to be single. Some of you may just feel down on your luck. Some of you may be pressed to text your ex (do not, I repeat do not text your ex). Some of you may feel like you want to give up altogether (which, I’m not saying that’s a bad idea entirely). But should you still feel the need for companionship — remember, you can always be a banana. Ladies (and gents)! What’s the wildest thing you’ve ever done in the world of internet dating? Or what wild things have you encountered? Would you try something like this? Tell me your stories in the comments below (or slip into my DM’s @minhbui_) and let me know. We’ll be sharing our favorite ones.